A large number of NRIs do not file taxes, as they live overseas and therefore believe that there is no need. However, there are two major situations when NRIs should file returns in India. Firstly, if the income earned in India exceeds the maximum permissible limit as basic exemption. At this point, the maximum exemption limit is Rs. 250,000. Incomes like salary arising from services provided in India, income from house property, capital gains arising from sale of property in India, income from deposits held in India will be taxable in India. Secondly, they should be filed to claim return if deducted tax is more than what was payable, so that you can claim a refund. There are two major situations when NRIs should file returns in India. Firstly, if the income earned in India exceeds the maximum permissible limit as basic exemption. At this point, the maximum exemption limit is Rs. 250,000. Incomes like salary arising from services provided in India, income from house property, capital gains arising from sale of property in India, income from deposits held in India will be taxable in India. Secondly, they should be filed to claim return if deducted tax is more than what was payable, so that you can claim a refund. A lot of NRIs are unaware of the fact that in order to track expenses and investments above a certain threshold for all individuals – residents or NRIs, Annual Information Reports (AIRs) have to be filed by various entities in India like banks, Mutual funds, bond issuers, registrars for real estate purchases above a certain value, amongst other transactions. Therefore, you could get a notice due to these reasons if your name appears in an AIR and you are not filing tax returns. Whilst this may not mean that taxes are due, you will need to respond to the notice, which can be rather challenging if you are out of the country. Thus, it is advisable to have your taxes in India in order. If you are a tax resident in geographies where you may be able to take tax advantage of the double taxation avoidance treaty between India and that country, you must take advantage of that. If you sell direct equity/stocks, short term capital gain applicable is 15%. The long term capital gain on sale of direct equity is Nil ie for equities held over 1 year. NRIs have to trade through a broker if they wish to invest in direct equities. They can trade only on delivery basis and intraday trades are not allowed. They have to open a Portfolio Investment Scheme (PIS) account where their trades get reported within 24 hours. If you are a tax resident in geographies where you may be able to take tax advantage of the double taxation avoidance treaty between India and that country, you must take advantage of that. Debt and Equity Mutual Fundshave different tax rules. For equity Mutual funds the tax rate applicable is 15% for holding period of less than 12 months and for holding period of greater than 12 months it is Nil. Non equity mutual funds ie debt funds, gold funds, are taxed like real estate ie the tax rate for a holding period of less than 36 months is as per the marginal rate. If you hold them for a period greater than 36 months a long term capital gain tax rate of 20% with indexation is applicable . If you are looking at investment options to save for your retirement goal then New Pension Scheme is an option you can look at. NRIs are allowed to invest in NPS. NPS is useful for NRIs living in Middle Eastern countries, since they do not have mandatory social security benefits in their countries of residence unlike many other geographies. NRIs own contribution is eligible for tax deduction u/s 80CCD (1) of income tax act up to 10% of gross income with overall ceiling of Rs. 1.50 lakhs u/s 80CCE of income tax act.From FY 201516investors are allowed tax deduction of additional Rs. 50,000 under 80CCD1(B). NRIs wishingto invest in FDs can look at Foreign Currency Non Resident ( FCNR) deposits. It is in the form of a fixed Term deposit account denominated in foregin currencies. In this case NRIs can park overseas income as foreign currency in India without having toconvert it to Indian Rupees. The rates on these deposits depend on tenure of investment and the currency in which you park your funds. Principal and interest are fully repatriable. For NRIs interest is not taxable in India. However, they could be taxed in the country of residence of the NRI, for example in the US. Similar is the case with NRE accounts. A resident foreign currency account (RFC) account can be used by NRIs who are returning back to settle in India, to park overseas income as foreign currency in India without having to convert them into rupees. Funds are fully repatriable and can be transferred from RFC to NRE and vice versa. Interest earned on RFC account will be exempt from income tax as long as you are Resident but not ordinary resident (RNOR). This is exactly what you need to ask yourself while reviewing your existing set of investments. Once you have decided your goals, you need to review your existing investments. This will give you a sense on which is the ones that are not doing well so that they can be replaced. It will also help you understand based on your asset allocation and goals that going forward where you need to invest so that your investments are in line with your goals. You may be having some investments in stocks, Mutual funds, Real estate, fixed deposits, gold, etc. Or there are even chances that your investments may be concentrated in some of the assets. If you have stocks in your portfolio and you understand bit of markets then you can decide based on what is happening in the economy, what are the sectors that are outperforming or under performing at that point in time, the demand environment, the credit environment, etc. and accordingly decide whether you want to keep it or sell it. A better way to do this would be by investing through Mutual Funds. There you will benefit from the expertise of the fund manager. It will also save you from micromanaging at security level. With the introduction of direct plans, you can now invest by paying a lesser expense ratio compared to a regular plan. Mutual funds can be used to take exposure in equity, both domestic and international, debt, mix of debt and equity through balanced or Monthly income plans, commodities and index. It’s not a great idea to lock in 70 to 80% of your wealth in real estate. Real estate has its own cycles of boom and depression. It’s difficult to sell these at the price of your choice. They are certainly not assets which can be sold immediately due to their illiquid nature. Doing so will need you to settle at lower prices. In real estate also there are some pieces which appreciate faster based on demand environment, location, etc. while some of them do not see much appreciation again due to unfavorable location, lack of demand, etc. Therefore, try to sell that piece of your property which is not yielding good returns and channelize your investments in some liquid and appreciating investments. Indians have emotional value attached to gold. These days there are options like sovereign gold bonds and Gold ETFs which can fetch you returns both in the form of value appreciation and interest. Going forward you can start this paperless form of investing into gold. Keep the investments which are doing fine and have a good future outlook, and allocate them to your goals. Give up the ones which are loss making and you do not see a scope of recovery any time soon. It’s important to cut losses when required. Last but not the least, remember why you are investing – don’t miss the forest for the trees. Some days back, in a discussion with a friend of mine, we once again ended up discussing whether mutual funds and in specific whether Equity mutual funds, play any role in goal based investing. 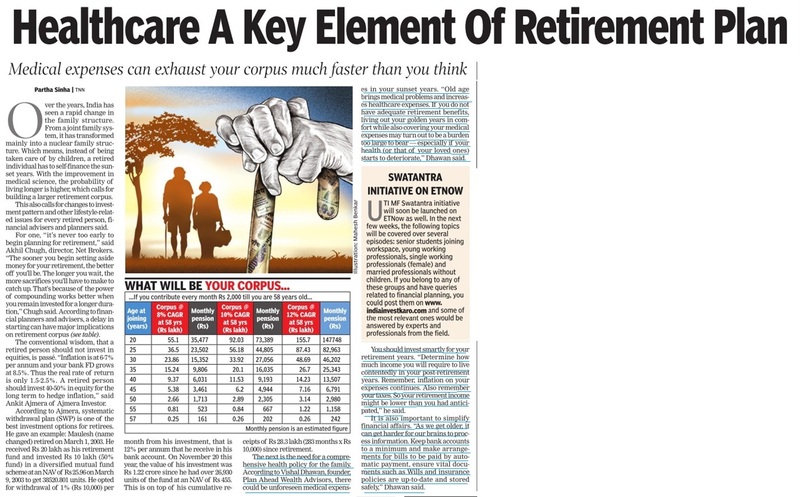 Can an investor gather any sizeable corpus by systematic investing? After a lot of discussion and arguements both for and against from her side and mine, I presented to my friend the below example. Suppose you were to invest Rs. 1000 in a SIP in a equity mutual fund from January 1995 till 30 Sep 2013, and invest regularly each month. Simultaneously one could also invest in the Sensex a similar SIP of Rs. 1000 for the same time duration. Once could argue that the returns would depend on the type of mutual fund scheme chosen. So as to avoid being partial to any particular style or scheme, we took the SIP and simulated it over many different types of schemes such as a large cap scheme, a mid cap scheme, a value category scheme and a hybrid equity oriented (balanced) scheme and the Sensex. When we tried to map the values of these SIP investments, the results were as you can see in the graph below. In the simple example above, we figure that an investor by investing Rs. 2.25 Lakhs over a time period of about 19 years, has been able to grow his money from a small Rs. 2.25 Lakhs to a sizeable corpus of Rs. 24 lakhs (in case of scheme A). She has been able to get phenomenal returns in the range of 20-21% each year, depending on the scheme selected (A to D). Even if the investor had invested in either the BSE Sensex or the CNX Nifty (Scheme E or F), she would have made returns in the range of 11% each year. This brings us back to the moot question. Can we use SIPs for goal based investing. The answer as we can gather from the above analysis is a big Yes. – past performance is not indicative of the future, but history does teach us some important lessons. So keep investing towards your goals and keep the faith !